Welcome to Scandi-land, our week-long celebration of Scandinavian design. To read more, click here. Imagine the quintessential Scandinavian-style home in your head. (We'll give you a few seconds.) If some far-north, Copenhagen-esque abode popped into your brain, you're not alone. 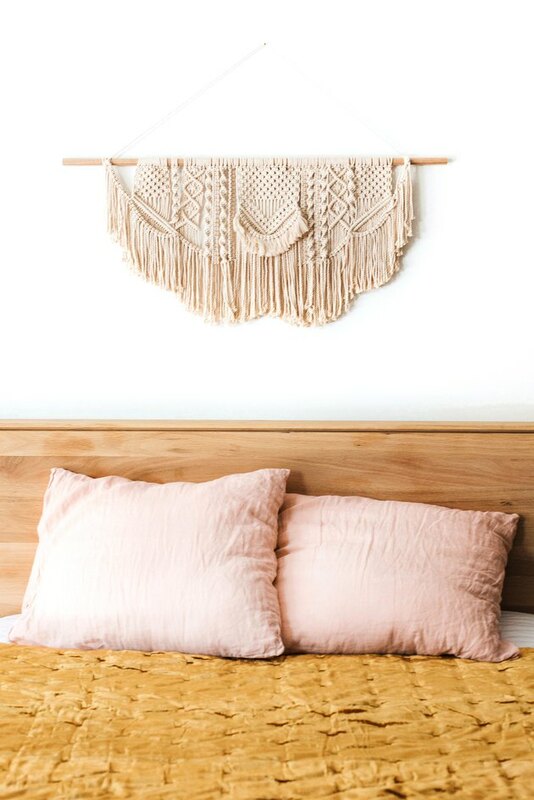 But what if you infused the same aesthetic with California desert vibes? 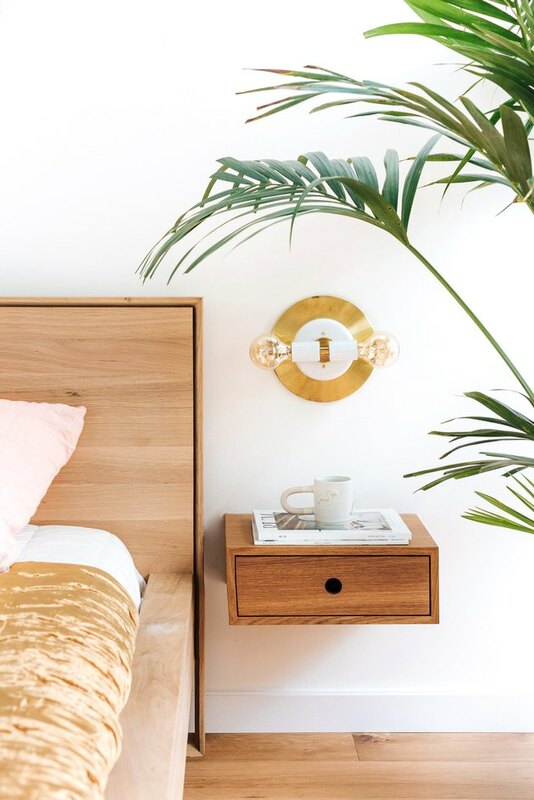 Once you (figuratively) step foot into the lush, Palm Springs-inspired home of Natalie and Bobby Tulsiani—artfully designed by Erin Roberts—you'll know it's possible. 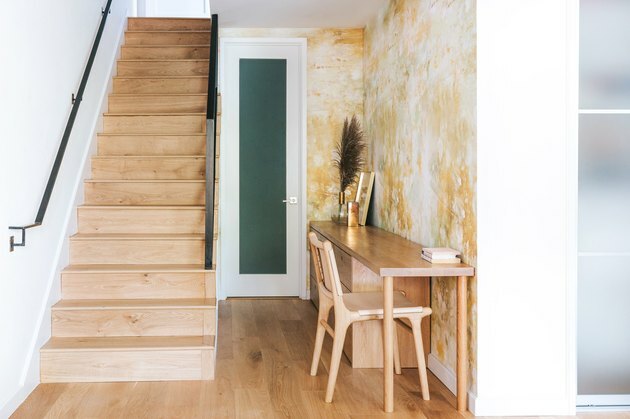 The design-enthusiast homeowners wanted to brighten the townhouse's moody interior (with former dark-gray floors and light-gray walls) and dial up the structure's potential to shine with natural light, while also nodding to Scandinavian minimalism. To accomplish these glow goals, Roberts approached the refresh holistically, paying attention to the small ways that "design can affect us emotionally and inspire happiness in our everyday lives." Every design decision was guided by the ethos that the home should be a sanctuary, just like the central feeling of hygge-filled Nordic homes. "When life gets stressful, a calming refuge at the end of the day does wonders for someone's happiness and peace of mind," Roberts explains. "Being able to unwind means having space to think, relax and allowing your eyes to rest." 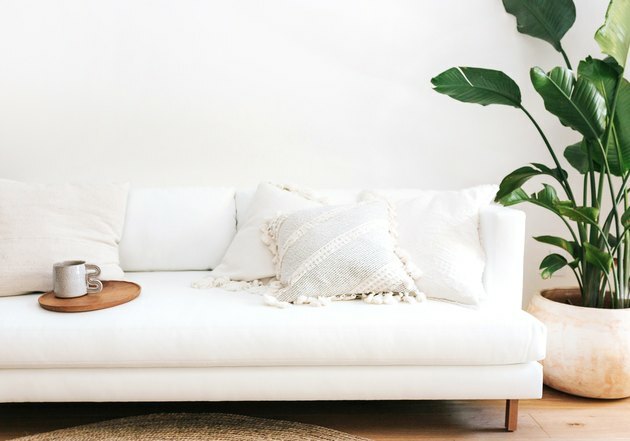 Roberts relied on thoughtful minimalism through and through—from her choice of paint colors down to the natural oak flooring, so everything has its place and purpose. And if you have a sudden hankering to sip an iced matcha poolside, you can blame the tropical kentia palms for those casual weekend-getaway vibes. "The white walls and white oak floors give that classic coastal feel, which creates an instantly calming vibe as if walking onto a beautiful beach waterfront," says Roberts. Don't forget to bask in the glow of the golden accents while you're here. Incorporating white-oak flooring—which Roberts did throughout the home for cohesiveness—might seem like the obvious choice when going for a clean look, but it can actually feel like a little-known secret. 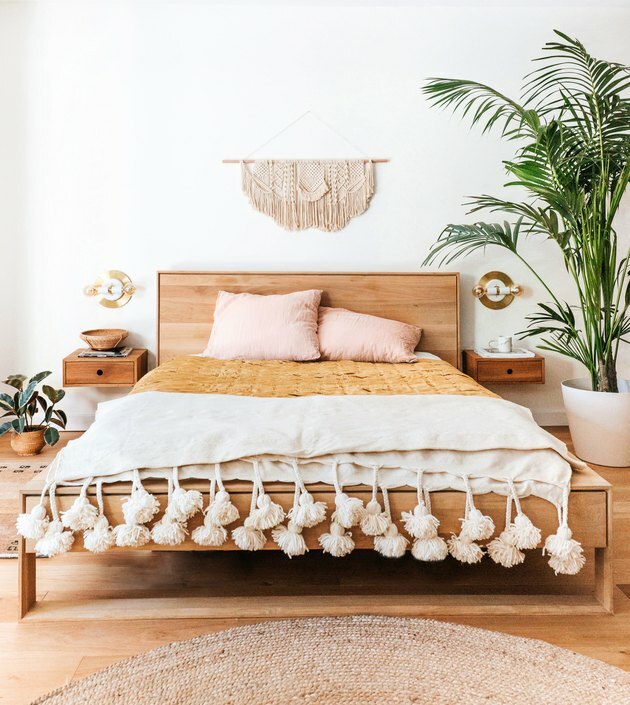 "As much as we see white oak floors in magazines, I think it's still quite rare to experience them in person, so when you do it feels incredibly luxe," Roberts says. Next, it was all about layering dreamy textures. 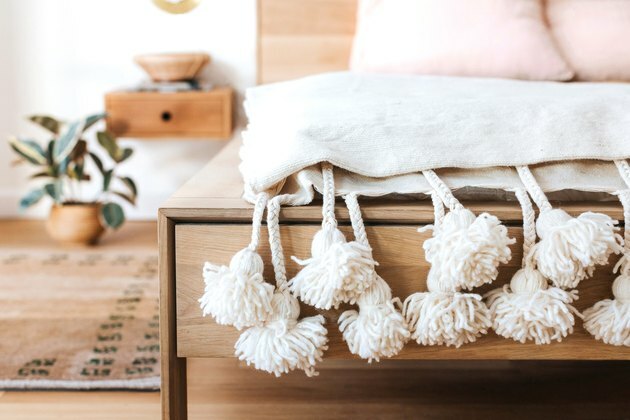 "Scandinavian design has a timeless way of making solid colors and natural linens look luxurious, so we took that quality to heart in creating a home that felt casual and lived in," Roberts says. There's something about a burst of color in a neutral environment that adds instant warmth—like the desert-getaway hues here, for example. "The pops of color were inspired by our love for Palm Springs and the iconic pink and yellow doors that can be found there," Roberts says. "Amongst all the calm neutrals of the desert, those few pops of color are playful, surprising, and uplifting." To give you a better lay of the (Scandi) land, the master bedroom takes up the entire lower level of the townhouse. From there, you can take a staircase leading to the main floor, which has become a favorite place for the family to lounge. "The room has a beautiful span of glass sliding doors that open up to a private garden patio, so we wanted to take advantage of the indoor-outdoor feel and bring in some large plants to connect the two spaces," Roberts says. This sun-drenched spot was destined to be a family room. To create a mix of coziness and timeless style in the mixed-use space, Roberts added a long white sofa near the window and carefully chosen furnishings. 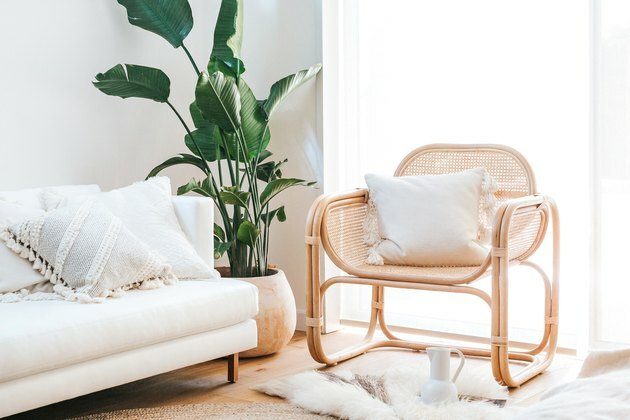 Besides being a conversation starter, the rattan lounge chair adds texture and lightens up the space with its natural beachside vibes. Roberts strategically placed natural elements including tropical greens, white linens, and white woods throughout the house. When plant shopping, consider how much light a room gets when you're shopping for greens. "Tropical plants and cactus will thrive the most with lots of direct sunlight, while philodendrons will wilt from too much harsh exposure," she says. "The gold wallpaper was one of Natalie's longtime favorites and we finally found the perfect place for it," says Roberts, who incorporated the dramatic (in a good way) wall covering in the hallway niche. "[It's] the perfect contrast to the rest of the calm, neutral interior," Roberts says. "Paired with some soft subtle peaches and lavenders it turned out to be breathtaking." 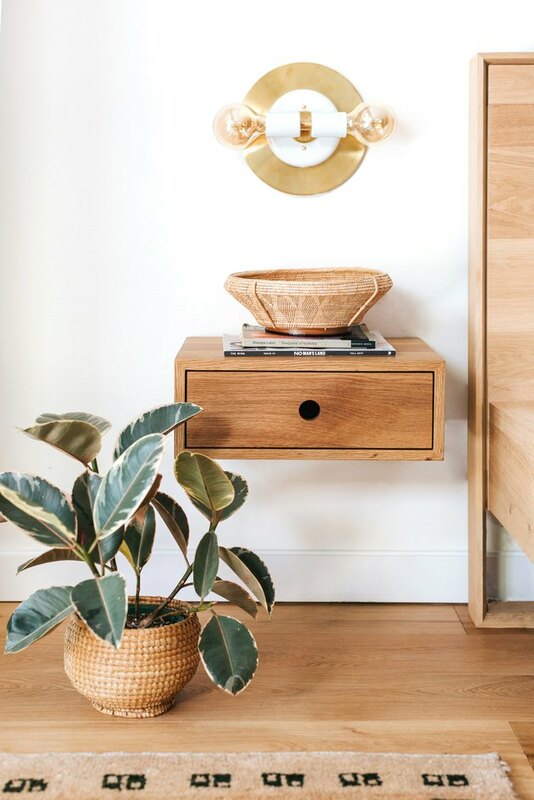 Every inch of the SF abode was designed with the guiding principle that every piece should be special, intentional, and spark joy—and with elements like this minimal built-in console desk in the entry way, it's mission accomplished.